Which Reed is Best for You? For an easy to play budget reed to keep costs down try the Oxford Reed. For a free-blowing reed with better tone try the Paris Reed. Which strength? If you're under 11 years old we'd suggest you order Soft strength, otherwise order Medium-Soft strength. How many? We recommend you order at least 3 reeds so that you have spares. For a medium-response reed with a mellow tone try the Regency Reed. Which strength? Usually it's best to order the same strength you've used before, but if in doubt we recommend you try Medium-Soft. As you develop, reeds need to be more specifically suited to your personal requirements. However most people are comfortable with the more popular reed styles - Paris and Regency - so we suggest you try one of these styles first to see how they suit you. Once you know how they play you can return them to swap them with another style of reed if it seems that a different style will suit you better. The Paris reed - if you prefer free-blowing reeds with light and resonant tone. The Regency reed - if you prefer mellow tone with some heart and substance. How many? We recommend you order at least 2 reeds of any new style to give an impression of what that reed style feels like. The best reed for you will be an individual choice and is difficult to judge accurately before you have tried any of our reeds, so we suggest you try one of the more popular styles first and once you know how they play you can return them to swap them with another style of reed if it seems that a different style will suit you better. The Reinhart reed - if you prefer rich dark tone with plenty of heart and more to blow against. If you wish for more technical advice on reed choice please call David on his mobile: 07921 861819. For further discussion on how elements of the reed affect it's playing characteristics please read on. Your needs as a player are very individual so what works for another person may not work as well for you. A number of things influence this - your make and model of oboe, your embouchure, your internal bone structure (mouth and nasal cavity), your breath pressure, and your personal concept of the sound you wish to make. When you have a reed issue to solve, or something to improve upon, it may help to study the following reed chart and read the information below. If you need further advice please call us or email us. Generally, the thicker the cane on the reed, the more mellow (dark) the tone of the reed, but the tougher it is to blow. If you want a darker toned reed, locate you current reed style on the reeds chart then try moving to a reed with more substance and a firmer response. A firmer reed will also require stronger breath support. If you are consistently having this problem with any reed style, it is best to try a more flexible reed. 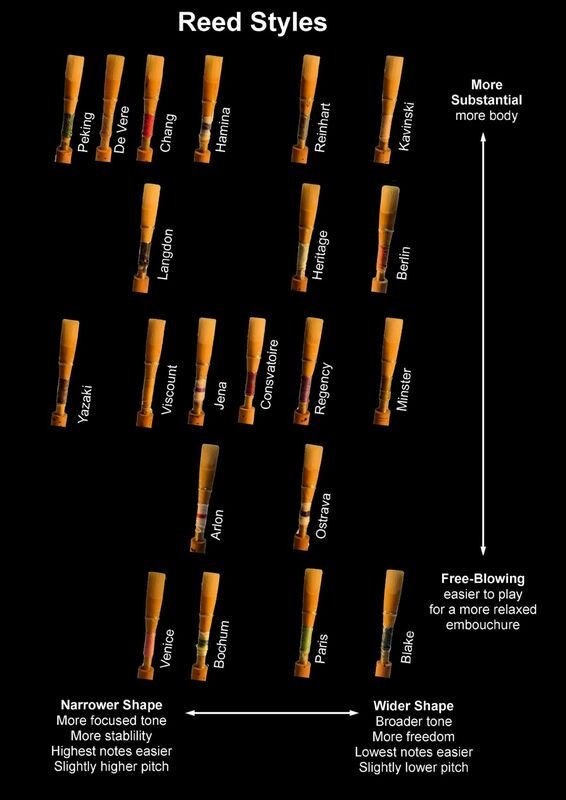 First find your current reed style in the reeds chart, and choose a more free-blowing lighter-weight style. This will give you a more free-blowing reed, and also a more resonant tone. In this case try a wider shape. If you are already using the widest shape then try a softer strength within the same reed style you are using, or alternatively change to a less firm or more responsive reed. Note that it is important to have your oboe checked for leaks by a reasonably regularly by an oboe technician, since leaks will cause low notes to be very hard to play on any reed. In this case try a narrower shape. It is also true that reeds with a thicker gouge will have more support in the blades which can help achieve high notes. If you change to a narrower shape and also choose a style with a thicker gouge this will enhance high notes but also require more breath support when you play. The overall size of the reed is too big. It may be too long or too wide. First try a reed style with a narrower shape; find your reed style on the reeds chart and choose a style to the left of it. This may solve the problem for you and give you a suitable reed. Your oboe bore style, embouchure and personal bone structure in your mouth and nasal cavity all influence how much you may be affected by this issue. The usual remedy is to try a different reed style with a narrower shape; find your reed style on the reeds chart and choose a style to the left of it. Most people assume that they need harder reeds but this is rarely true. The problem usually stems from poor breath support causing the player to have to pinch or bite the reed too firmly to make it speak. This problem will get worse if the player moves to harder reeds. Better to try some exercises to improve breath support and loosen the embouchure. See the Hints and Tips page for how to do this. Playing sharp is more common in hot weather as the higher temperature raises the pitch the instrument plays at. Naturally, you would pull the reed out of the oboe slightly to lower the pitch. If you are always significantly sharp you may need to change the reed style you use. Try a wider shape; find your reed style on the reeds chart and choose a style to the right of it. Sometimes in moving to a wider shape players find the pitch stability becomes poor and the reed seems wild and uncontrollable. If this happens, try moving to a wider style with a thicker gouge or a firmer response - the harder/firmer styles will tend to be more stable. For example: A player plays on Regency reeds (Medium strength) but plays sharp, so they try the Minster reed (Medium strength) which plays at a lower pitch. However, they find the wider Minster wild and unmanageable, playing sometimes sharp, sometimes flat. They therefore try the Berlin reed (Medium-Soft strength) - a more stable stiffer reed, but at a slightly lower strength. If none of this solves the problem adequately you may ask a specialist oboe technician for a reed well insert - this is a small (usually 1mm or less) piece of the bottom of a staple which is inserted semi-permanently into your oboe’s reed well so that the reed sits inside the oboe at a higher point, flattening the pitch (the reed well can easily be removed by a technician if you sell the oboe in future). Wide W4 - promotes a very broad tone, increased low-note response, slightly lower pitch, more freedom (e.g.Minster Reed). Medium M3 - promotes a broad tone and good response throughout with good freedom (e.g. Regency Reed). Narrow N2 - promotes a centred tone with good response throughout and some stability (e.g. Viscount Reed). Flared ND - promotes a focused tone, increased high-note response, slightly higher pitch, and good stability (e.g. Jena Reed). Very Flared NT5 - promotes a focused tone, increased high-note response, slightly higher pitch, and very good stability (e.g. DeVere Reed). Very Narrow N1 - promotes a very focused tone, enhanced high-note response, higher pitch, and very good stability (e.g. Yasaki Reed). Thin U-scrape - gives a light clear resonant tone in a free-blowing reed (e.g. Paris Reed). Standard U-scrape - gives a warm mellow tone with good response (e.g. Regency Reed). Thick U-scrape - gives a rich dark tone with a substantial feel and good firm response (e.g. Reinhart Reed). European W scrape - gives an open resonant tone and a more open, looser feel for the embouchure (e.g. Ostrava Reed). American W scrape - clear, very responsive and designed for the American embouchure (e.g. Boston Reed available on special request). A thinner gouge creates a more responsive reed and a clearer, more resonant sound and more freedom for the blades. A thicker gouge dampens vibrations producing a darker sound, less responsiveness, and more support to the blades.